lairiba radiomeeter UV-A, UV-B ja UV-B311nm kiirgustiheduse mõõtmiseks. The X96 (Xnine six) with its XD-9501-4 detector head is a compact lightweight radiometer for the measurement of UV-A and UV-B irradiance in W/cm² . UV-A and UV-B irradiance measurement of polychromatic UV phototherapy exposure equipment including full body booths, UV hand & foot devices and UV combs. The XD-9501-4 irradiance detector features a two sensor UV-A (315-400nm) and UV-B (280-315nm) design in a compact light weight housing. Both sensors are cosine corrected with a diffuse window offering. Calibration using a broadband UV standard source is included. UV-B311nm irradiance measurement of monochromatic 311nm TL-01 type ultraviolet radiation therapy lamps. The XD-9501-4’s UV-B sensor receives an additional calibration using a monochromatic light source at 311nm (TL-01). The X96 meter is a handheld battery operated meter with 9 mm high character LCD display for easy viewing. It offers a wide dynamic amplifier with seven automatically or manually selected gain ranges. Operating the X96 is simple you only need to switch on the meter and select the detector for the measurement. The meter is operated by a standard 9V battery. An BHO-11 hard-shell case is supplied. 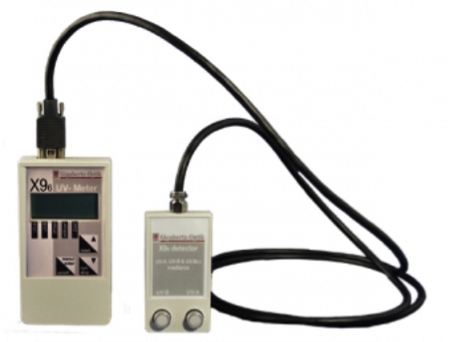 The detector and the meter are traceable calibrated to international standards.